Padres lefty Clayton Richard was placed on the disabled list earlier today due to inflammation in his left knee, and manager Andy Green now tells reporters that Richard is headed for season-ending surgery to alleviate discomfort that he’s pitched through since April (Twitter links via MLB.com’s AJ Cassavell and the San Diego Union-Tribune’s Kevin Acee). Richard, 35 next month, pitched to a respectable 4.43 ERA (4.18 FIP, 4.06 xFIP) with 6.9 K/9, 3.4 BB/9, 0.80 HR/9 and a 57.9 percent ground-ball rate through 124 first-half innings this season. However, his 2018 campaign has gone off the rails in a miserable second half that has seen him (perhaps literally) limp to an 8.57 ERA with 4.1 K/9, 3.4 BB/9, a whopping 2.80 HR/9 and a 53.5 percent grounder rate. Richard is far from a flamethrower, but a look at his season-long velocity charts show that his fastball has dropped in the month of August as well. Richard is earning a $3MM base salary in 2018 as part of the two-year, $6MM extension he signed with the Padres late last season, and he earned a pair of $250K bonuses for crossing the 125-inning and 150-inning thresholds. He’s under contract for the 2019 season as well at that same $3MM rate and will once again have up to $1.5MM worth of incentives available to him — though he’d need to reach the 200-inning mark for the first time since 2012 in order to do so. The Padres will likely look to Richard as a stabilizing innings eater in their rotation once again in 2019. While some of their promising young arms have begun to surface at the MLB level — Joey Lucchesi, Eric Lauer and Jacob Nix are among the team’s prospects to debut this season — there’s still a need for a bridging presence while that trio looks to establish themselves. Meanwhile, promising arms like MacKenzie Gore, Chris Paddack, Logan Allen, Cal Quantrill, Adrian Morejon and Michel Baez (among others) continue to work their way toward San Diego as the Padres’ front office eyes aims to compile a homegrown core of arms around which to build. While some other youthful National League clubs have shown big strides thus far in 2018, the Padres remain buried in the NL West and don’t seem to be going anywhere this season. The rotation’s performance, to be sure, has not helped matters. But that doesn’t mean it can’t be a source of some summer trade assets. 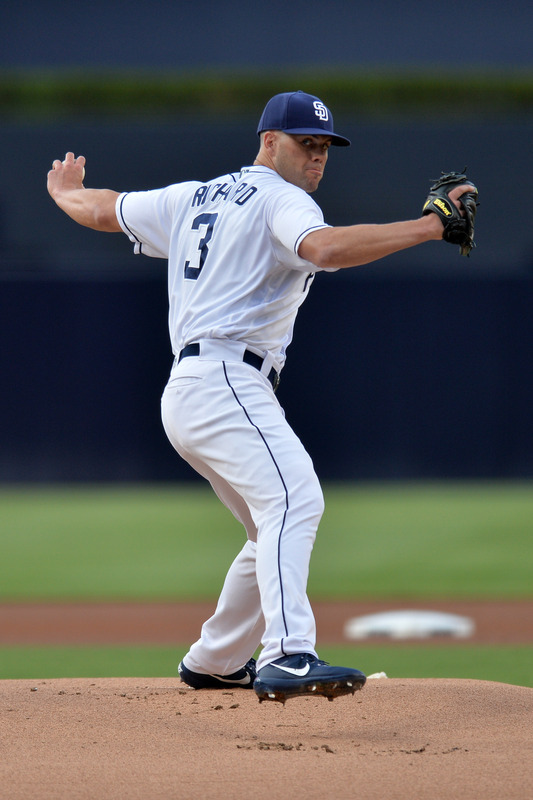 Late last year, the Friars reached a two-year, $6MM extension with Clayton Richard. In December, they added Jordan Lyles for a meager $1MM guarantee in a deal that also includes an option for 2019. 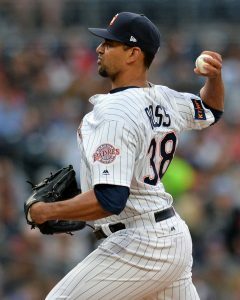 And when the calendar flipped to 2018, they brought back old friend Tyson Ross on an incentive-laden, minor-league pact. In the aggregate, the strategy wasn’t all that different from the one the Pads used in the prior winter, when Richard joined Trevor Cahill, Jhoulys Chacin, and Jered Weaver as low-cost free agents that landed in San Diego. In both cases, the idea was to buy up some cheap innings while potentially opening the door to a mid-season trade return. To this point, despite the generally poor performance of the San Diego starting staff, the trio of veteran assets has been rather cost-effective. Indeed, all three are worthy of tracking for organizations weighing deadline additions. The fact that none will break the bank is of particular note, especially in a world in which several contenders will be looking to improve while staying beneath the luxury tax line. At first glance, Richard does not appear to be doing much of interest. He’s carrying a 4.87 ERA with 7.7 K/9 and 3.1 BB/9 through 61 frames thus far. His typically superlative groundball rate is down, albeit to a still-excellent 54.4% rate. And he only managed a 4.79 earned-per-nine rate as a starter in 2017. True, it’s probably not worth getting too terribly excited over the 34-year-old southpaw. But there’s much more to the story. Richard is sporting a career-best 10.2% swinging-strike rate. Fielding-independent pitching metrics such as FIP (3.78), xFIP (3.48), and SIERA (3.90) all feel he has outperformed his results thus far in 2018 — and likewise that he did so last season. Though he has been tagged when facing an opposing order for a third time, he has been much more useful in the prior two times through a lineup. Taken together, it’s not hard to imagine the right organization viewing Richard as quite a useful asset. He’s averaging six frames per start and thus could fill out a rotation or serve as a long man down the stretch. And he has been particularly stingy against opposing lefties, who are hitting just .226/.298/.308 against him, so there’s also some postseason swingman/lefty specialist potential here. That’s an interesting combination. Certainly, scouts will be watching to see how Richard throws as the deadline approaches. The same is true to an even greater extent with regard to Lyles, a 27-year-old who’s off to his most promising showing in some time. Over 37 2/3 innings through 16 appearances — three of them starts — he has compiled a 3.11 ERA with 8.6 K/9 and 2.6 BB/9. To be sure, there’s a lot left for Lyles to prove. He has enjoyed a stingy .233 BABIP-against, though Statcast figures indicate he hasn’t needed much luck in the batted-ball department (.260 wOBA against a .286 xwOBA). Clearly, opponents’ success on balls in play will go up, but the lack of good contact suggests that there’s more than just sample fortune at play. Notably, too, Lyles has thus far managed a career-best swinging strike rate (10.9%) and average four-seam velocity (95.2 mph). It’s worth bearing in mind that both Richard and Lyles come with affordable future control. While the Padres may yet have designs on making a leap in the standings in 2019, and might look to bolster their rotation further, it’ll be hard to add too many pieces in one winter (even from within). The club will surely value the right to control such useful arms at minimal rates of pay, meaning neither will be available unless the return is at least of some interest. That’s not quite the same situation for the 31-year-old Ross, who has been the Padres’ best starter thus far. He’s only under contract for the present season, so barring a Richard-like extension, he’ll be a free agent at year end. Since reuniting with the Friars after a miserable season apart, Ross has looked something like his old self. Over 53 2/3 innings, he’s sporting a healthy 3.35 ERA with 9.2 K/9, 3.7 BB/9, and a 46.2% groundball rate. He still doesn’t throw as hard as he used to, but has regained some (but not all) of his ability to generate swings and misses (9.9% this year). If the deadline was closer, Ross would probably be the pitcher of the three generating the most attention. But we still have some time for things to shake out. The Statcast data does indicate that Ross has been a bit fortunate to allow only a .273 wOBA to opposing hitters, as the quality of contact would suggest a more robust .324 xwOBA rate of output. He has thus far suppressed home runs quite well, as he did traditionally, but any slippage in that area could also reverse the ERA fairly quickly. Taken together, the Padres hardly have a slate of major trade assets in their starting five. But this trio could all draw interest over the summer.